Going in, I did not know what to expect from the classes. 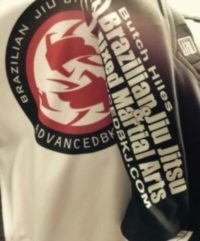 I have been to other martial arts classes in the area only to be let down by either high cost for little instruction or just simply non-realistic systems. As a newcomer to the classes I was surprised how easy-going the instruction is. Students that have been participating longer than I, are not there just to win but rather they are like "instructors", each with something that you can learn from. I take pride in being apart of this school. Congratulations on everything. I know of no one more deserving. If I was a wuss I would shed a tear, considering how much you have given to not only the sport but also to the countless people you have impacted throughout the years (myself included). I do not think I could be happier, so congratulations once again. Butch we have supported each other since the beginning. I look at that video with you and Royce Gracie, I think of your great dedication to the mixed martial arts. Most of the credit belongs to you. I would not of had much reason to go on. You made gains and sacrifices that inspired me. There are many in West Virginia that have been fighting this long tough battle as well. I am very proud of you and all the ones fighting fir MMA in WV. I am honored to be one of you. You guys are all helping me tremendously and last nights workout was just another example of that (having folks like you to roll with is a gift - other gyms I've been to really don't compare). I appreciate the patience to teach me, too, since I know I'm very behind curriculum wise. Definitely getting lots out of the workouts! Butch, you've made a difference in many peoples lives. You've even changed the laws of an entire state and for that we are all thankful! "I'd like to say thanks. If it weren't for you and all of your efforts to legalize mma in WV, I would never have been able to experience the UFC as we did last night. Cage side seats and a complete tour of their operation in full swing. Thanks very much.."